Hi can you provide an update on when a fix is coming? There are so many free libraries available, why don’t you just change the library out? doesn’t support QR codes yet, working on that. This is great news, thank you! Do you mean that you can’t start it when a page loads, but need to start it with a button…or something else? got it…what does Levon mean above “it won’t work in automatic mode” ? 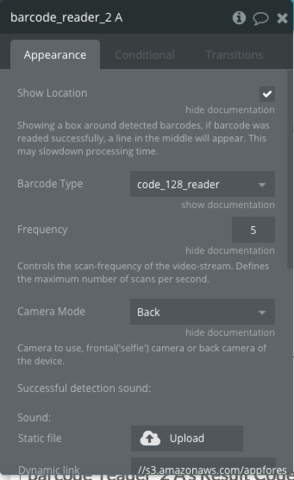 barcode_reader_2 element doesn’t have stop live decoder action. we’ve just added action - Stop live Detector. Can you please explain where the automatic mode is located because I have no idea what you are referring to in a previous post. My app is now broken and the reader won’t start. A few screen shots now and then don’t hurt.